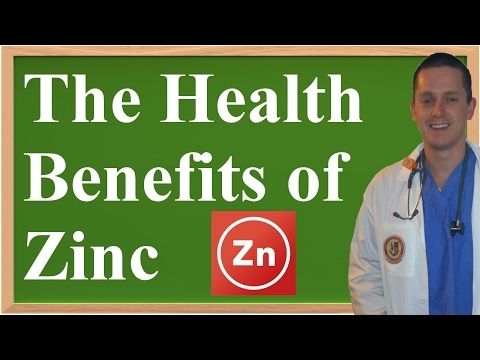 The Zinc mineral is one of the family of trace minerals and is vital to all stages of growth. Zinc is an essential must have mineral and is found in nearly every cell inside the human body. The activity of up to one hundred different enzymes rely on the Zinc mineral to stimulate them. Enzymes are the substances that cause various chemical reactions to take place inside the body. For instance, zinc helps ensure that the immune system remains healthy and is able to fight off disease. It accomplishes this because it helps produce and activate T-lymphocytes, one type of white blood cell that the body uses to help fight infection. Zinc plays many other key roles. It is involved in the complex process of healing wounds. Without zinc, a person's sense of smell and taste may become diminished. Zinc is also involved in the synthesis of DNA. One of zinc's biggest responsibilities is to help ensure that a person's various stages of growth occur along normal guidelines, beginning with pregnancy and continuing through childhood and adolescence. It is also needed to ensure that the reproductive system develops normally. Zinc helps transport Vitamin A from the liver and it also acts as an antioxidant, protecting the cells from the potential damage that can be caused by free radicals. Many different foods contain some amount of zinc. On a per serving basis, oysters contain the greatest amount. But oysters are not part of the common diet. And that's okay because red meat and poultry are two good sources and they're popular choices among many cultures. Whole grains, nuts, beans, some seafood, dairy products and fortified foods are also good sources. Care must be taken however, not to consume too much zinc. This is easy to do if a person eats a lot of fortified foods and also takes a zinc supplement. Doing so impedes the body's ability to properly absorb copper which also is needed to keep the immune system operating correctly. Too much zinc can also impair the formation of blood cells. Since zinc is vital during all stages of growth, infants up to 3 years of age should get 3 mg/day. Children need more and should increase intake to 5 mg/day. And adolescents need even more. They should get at least 8 mg/day. Adult men and pregnant women need 11 mg/day while adult women who are not pregnant or breastfeeding need only 9 mg/day. Finally those women who are lactating should up their intake of zinc to 12 mg/day. Some people cannot properly absorb zinc and this situation could lead to a zinc deficiency. Deficiencies also occur when people do not increase their intakes accordingly as they go through the different growth stages. The most notable symptom of a zinc deficiency is retarded growth. Sexual function and capability can also be delayed. Diarrhea, loss of hair, wounds that heal slowly, impotence, lethargy, and trouble with the sense of taste, loss of appetite, diminished immune capability and lesions that appear on skin and the eyes are other possible symptoms of a zinc deficiency.